We are currently accepting pre-orders for Classrooms, & anticipate castles to be available for the general public to purchase by May (weather permitting). These castles are actually a beautiful Curassavica plant (annual) with seeds of the Swamp (asclepias incarnata) milkweed plant (perennial) included, with 2 Monarch eggs on each plant. They are netted. Take them home, watch your eggs hatch into a caterpillars, grow very large and turn into chrysalis’, followed by the emergence of beautiful Monarch butterflies. 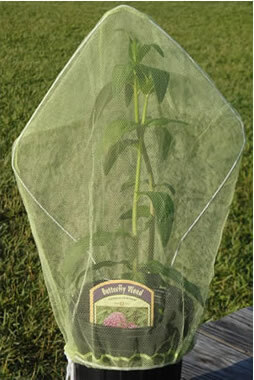 Once the butterflies are born, take the netting off the plant and release your butterflies into the environment. Hurray for you for contributing to the Monarch population — Monarchs are an endangered species — they need our help to continue to be around! After you release your Monarchs, you can plant the milkweed in your garden. A nice sunny spot works best. Then every year the milkweed will come back, feeding Monarch caterpillars for generations! Cost for the entire kit complete with instructions is $20.00. Caterpillar Castles are available during the months of late April, May, & June at our 10 a.m. Saturday family shows (and during our Retail Plant sale hours on Saturdays while supplies last). If you are coming with a group tour during the week we must know the number of castles in your order at least 5 days prior. If you just want to purchase a castle and are not planning on coming for a show you must email or call to place an order and set up a time to pick up. Teachers, this is a great way to enjoy the life cycle in your classroom – purchase several plants and caterpillars, watch the cycle, free your butterflies and plant your milkweed in the school’s garden so you can watch the process for years to come! Remember the natural life cycle of the Monarch for our area begins in late April and ends in early October. Monarchs migrate to Mexico in October to overwinter. We do NOT have life cycle kits in the winter months. To order your caterpillar castles, please email us at allaflutterfarms@gmail.com or call 336-454-5651. These are pick up ONLY, we can NOT ship them.